I noticed that C.S. Lewis's essay, "A Note on Jane Austen," existed while enjoying some meanderings around different internet sites. Someone somewhere mentioned it at some point and I tried to find it in full on the www but failed. I did manage to scrounge it up at a university library in a volume called Selected Literary Essays by C.S. Lewis, edited by Walter Hooper and published in 1969 by Cambridge University Press. I thought I'd share the info here since no one really seems to talk about these two English writers together, despite their popularity in the early 21st century in print and, especially, in film. The author of the really, really successful Narnia series of children's books Lewis was a great academic, too. His style of writing is peppered with classical allusions but is also very readable and enjoyable. He quotes other critics of Austen, uses French and Latin terms and phrases, and quotes the Austen novels themselves, of course. He does not seem to be a fawning fan of Austen's. He calls Mansfield Park "in places the best, yet as a whole the least satisfactory, of Jane Austen's works;" he says that the character Fanny Price could have been handled better by Charlotte Bronte; he states (when defending Fanny) that "[he] is far from suggesting that Fanny is a successful heroine." He does, however, seem to have an admiration of Austen. Lewis refers to her "commonsense" and "morality." He states that " 'Principles' ... are essential to Jane Austen's art." And he goes on to state that "If charity is the poetry of conduct and honour the rhetoric of conduct, Jane Austen's 'principles' might be described as the grammar of conduct. Now grammar is something that anyone can learn; it is also something that everyone must learn." To my own humble blogger's self this seems to me that Lewis is saying that if everyone must learn principles, then they're a good thing; and, if principles are essential to Austen's work, then her work is admirable. At the essay's end, Lewis makes a statement about Austen and her work that, to me, seems quite appropos for the theme of this blog and, as such, I will quote it: "She has, or at least all her favourite characters have, a hearty relish for what would now be regarded as very modest pleasures. A ball, a dinner party, books, conversation, a drive to see a great house then miles away, a holiday as far as Derbyshire -- these with affection (that is essential) and good manners, are happiness." So, I guess we're not the only ones who like the bright side. What's your most prized book? "Which name do you like better - Josephine or Stephanie?" Sigh of an exasperated older person. "I don't know. They're both nice." "Look, I don't know they're both pretty. Which name do you like better?" "I don't know," I'd shrug to their further annoyed sighs. So, in keeping with tradition, I have decided to ask a question for which I don't have my own answer: Hey all, what's your most prized book? Because I'm not such a selfish little inquisitor anymore I guess I'll break tradition and hasten a guess as to what's at the top of my list. Anything signed by the author, like my copies of Lauren Willig's The Deception of the Emerald Ring and The Masque of the Black Tulip. Any of my lovely books from childhood. My old Gone With the Wind. I look forward to hearing your picks! You've gotta feel for the kid. They say some things weren't meant to be...and, perhaps, some books just weren't meant to find the proper owner. I was at a library book sale recently trolling for some unique find - something that I couldn't just walk into a Barnes and Noble and buy, one of those you-know-it-when-you-see-it-finds, probably some super old hardcover someone once bought for fifty cents back when the nickel had a buffalo on it and the Wheatpenny was being minted and circulated. I like those. Of course, I wasn't the only one searching. There were many book hunters there all out to fill their brown bags at about a dollar a book. I felt a vicarious thrill when I overheard a woman purchasing $99 dollars worth of stuff. I already knew something was up when I walked in and saw the volunteer sales staff bustling around placing piles of books in boxes for her and asking if she'd be able to carry it all. She added one paperback to make an even hundred and pushed it all out on a two-wheeler. There was one guy talking to himself and another talking to me trying to praise a book I knew I was unlikely to read. I politely listened and then, when he was gone, returned the book to its place. And there were kids running all over the place. As I perused the Nancy Drews and other such classics, I heard a little voice behind me. "Excuse me," it said. And then again, "Excuse me." I turned to find one of the little ones behind me. "Have you seen any Magic Tree House books?" I responded that I hadn't, but would let him know if I did and continued my browsing. Back to picking through piles of books I went, searching all the sections to see if any old stuff was hiding there. It doesn't matter much that they're torn and tattered and not worth anything; just knowing that they were in someone's shopping bag, or wrapped neatly with brown paper and string, in 1910 is enough to make it interesting to me. So I was having a merry time trying to decide if I wanted to purchase this autobiography or that novel and I heard that voice again. "Have you seen any Magic Tree House books yet?" I repeated my intention of letting him know if I did see one and I moved on. I clutched a 1945 Sinclair Lewis novel that was in pretty bad shape, described on the copyright page as "A Wartime Book" which was "made to comply with the Government's request to conserve essential materials." That's interesting, I thought, and possibly worth a dollar. So I moved around the room considering the purchase. New people came and old ones left, including Magic Tree House kid. I was still there and had pretty much seen everything but, attracted to the place like a moth to a porch light, I lingered. I took one last look at what I guess one might call the antiquarian (really cheap antiquarian) books, didn't see anything again, and decided I'd spent enough time there and should leave already. I decided to go with the Lewis and paid up. But wait. What was that water-warped book with a unicorn sticker stuck to the solid purple cover? Not knowing why it intrigued me, I reached over and took a look. But your kid has gone away, I yell at it. For there, disguised and looking like it had just been dragged out of one of the seven seas and air dried, was a Magic Tree House book. Can booklovers and their paperbacks be star crossed? Introducing the official Good Books, Bright Side kitty! How beautiful is she? She's a literate kitty, too. After poring over Of Mice and Men yesterday, she had a hankering for something lighter. Romy is the GBBS kitty, after all; while she appreciates a great literary work, she also loves to look on the bright side. So now she's having a hard time choosing between Beverly Cleary's The Mouse and the Motorcycle and Eve Titus's rodent sleuth The Basil of Baker Street. Then there's also Stuart Little by E.B. White. Too much good stuff to choose from! Well, a love of words is bound to blossom when your kind have grown up in bookstores for ages and ages. And when you're named after the French word roman, or novel, you're practically destined for it. Actually I, after surveying Romy's pleasure-reading picks, am inclined to read some of these myself. How very odd. Never was that interested when I was a wee one. But then I don't know which of her nine lives she's on; compared to her I may be a youngster, indeed! Harrumph! I'm a bit peeved. Sometimes one reads something that gets a tad under the skin and requires a comment. Happy thing, then, to have a blog. 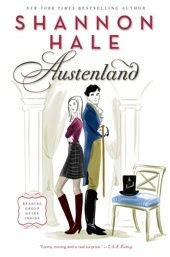 I was over at a couple of the websites that I peruse regularly and there are discussions going on about the book Austenland by Shannon Hale, which I read about a year ago. I was fortunate to have gotten an advanced reading copy which I enjoyed very much, but now it seems the paperback edition is out and I'm eyeing it for its cute cover design. As you can tell, I liked a lot about this book. Not everything, mind you, but a lot. The plot concerns a woman, thirtyish, who has a Pride and Prejudice obsession she is trying to purge herself of. For some reason, she thinks flooding herself in the world of regency England will help in this endeavor. Tiny little problem with the plot there, IMO, but no matter. It allows for a fun story to ensue in which the protagonist, Jane, visits an all-Regency-all-the-time resort. And there is a disturbingly fuzzy line between reality and script throughout the book as the guests of the resort interact with the resort actors, who are always in Regency character and terrible flirts. This seems to be a requirement of their jobs, which raises a whole ethical issue. But this novel is a light-hearted piece of beach-reading fun and that ethical discussion is something I'll save for another time. Now, why am I peeved? Well, there's been a bit of impassioned criticism by readers that's directed towards the way the main character has been written. They cry immaturity since she becomes attached to one of the resort's actors after several embraces which she takes to indicate a level of seriousness on his part. There's a refrain I hear echoing from the critics: a woman that old thinking that such behavior may actually mean a guy likes you! Horrors! Apparently, the notion is a bit unbelievable to people. I'd like to submit that perhaps it's actually charming. I mean every corner we readers turn we're faced with uber-sophistication. How many references to high-end stores, margaritas, and one-night stands can a book hold without making a reader sick? There are few stories nowadays where this kind of thing isn't overdone and it has become a little nauseating. So, to see a story where the characters have a bit more taste, well that's just plain nice. And, let's remember, this is a story about a place where Regency life is (sort of) recreated, a time when a kiss could be tantamount to a proposal of marriage. So it's not all too inappropriate for the heroine of an Austen take-off to model arguably similar attitudes as, say, an Elizabeth Bennet or a Catherine Morland.